This is Burnout. That's the first thing that crossed my mind in the middle of my race against a group of other writers. And why not? Need For Speed: Hot Pursuit and Burnout share a pedigree. Electronic Arts' Need For Speed: Hot Pursuit promises to go back to the series roots with exotic cars and high-speed police chases, but the roots that the game is going back to feels more like Burnout's and that's a great thing. The Need for Speed racing series has passed through a plethora of development studios, almost always managing to rack up significant sales. But over the years the series lost me to other entries into the arcade racing genre. Top of that list was Criterion Games' Burnout series which delivered over-the-top crashes and an invigorating sense of speed to the genre. So it's no surprise that I fell head-over-hells for Need For Speed: Hot Pursuit when I had a chance to play it last week. With Criterion helping development on the game, a lot about Hot Pursuit felt familiar. 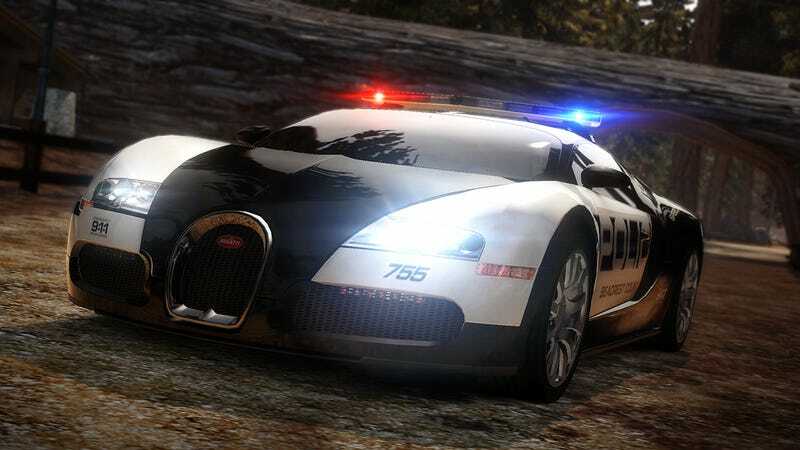 Before giving us a chance to run through a complete, albeit all-too brief, race in the game, the developers explained that with Hot Pursuit they wanted to bring the Need for Speed series "back to its roots of exotic cars and epic drives." They also showed off the autolog, unveiled at Electronic Arts' GamesCom press conference earlier in the week. Autolog is meant to make the game more communal, challenging and one-upping friends easier. After the short talk we dropped into a race, running through a track in the game's Seacrest County, an open world that is four times larger than Burnout Paradise's Paradise City. The game's controls weren't just familiar, they were Burnout, or just nearly. The handling did feel a bit different with true slipstreaming and cars that are meant to behave much more realistically, and uniquely, then they ever did in the Burnout games. There were also some visual tweaks, like a rear view mirror that showed color-coded silhouettes instead of the actual cars to make it easier to distinguish who is who in a race or pursuit. There were also plentiful, beautiful weather effects, like mist kicking up from wet pavement. I managed to maintain first place until the bottom half of my last lap, blowing a turn and wrapping my car around a solid barrier. The slip up cost me the race and reminded me of some of the soul-crushing, best moments of virtual racing in the Burnout series. Hot Pursuit is the sort of game that's going to sink its claws into me when it hits the PS3, Wii and Xbox 360 on Nov. 16, and I'm going to like it.